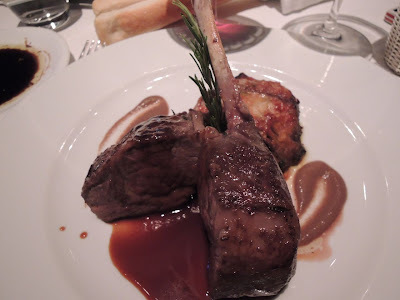 Food guest blogger hkLifestyleGeek visits Grissini and give us her thoughts. Chef de cuisine Andrea Fraire is settling on well at Grissini and continues his style of letting the natural flavours of the ingredients speak for themselves. Until the end of the month he has a Campanian promotion featuring fresh seafood and produce from the southern Italian coastal area. 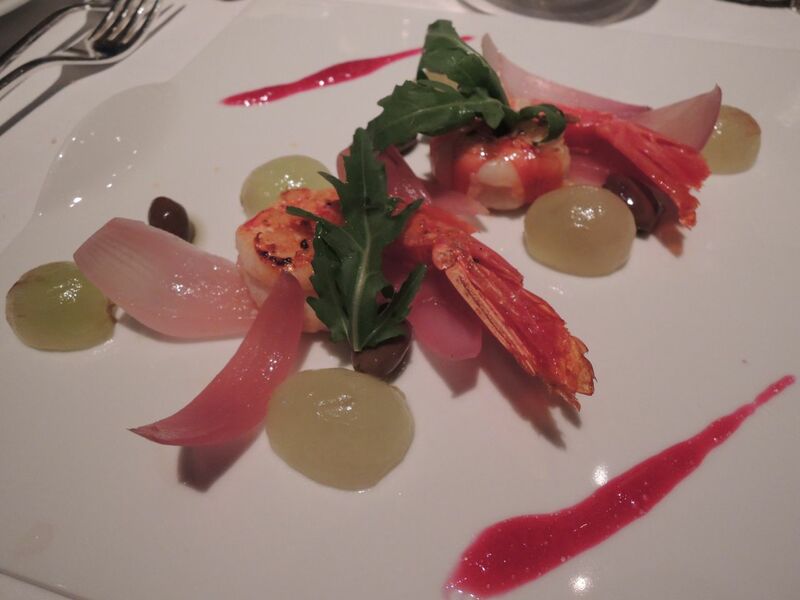 For starters, the seafood appetiser of roasted prawns, Montoro red onion and grape salad with baked olives is refreshing and light. The prawns were juicy and plump, cooked perfectly and sweet in flavour, and went well with the lightly cooked onion slices and peeled grapes, all artfully placed on the plate. 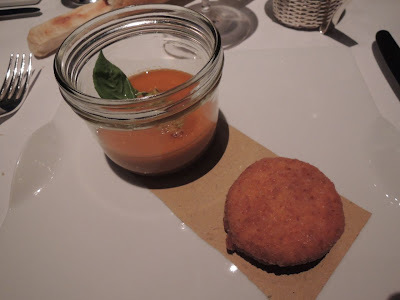 Next came a warm summer soup – chilled bell pepper and zucchini that came in a small glass jar. Unfortunately it didn’t have much taste and the temperature of the soup didn’t enhance the flavours much either. It came with a fried buffalo mozzarella in a crispy bread crust. One bite and the cheese oozed out which made it difficult to eat elegantly in a high-end restaurant. 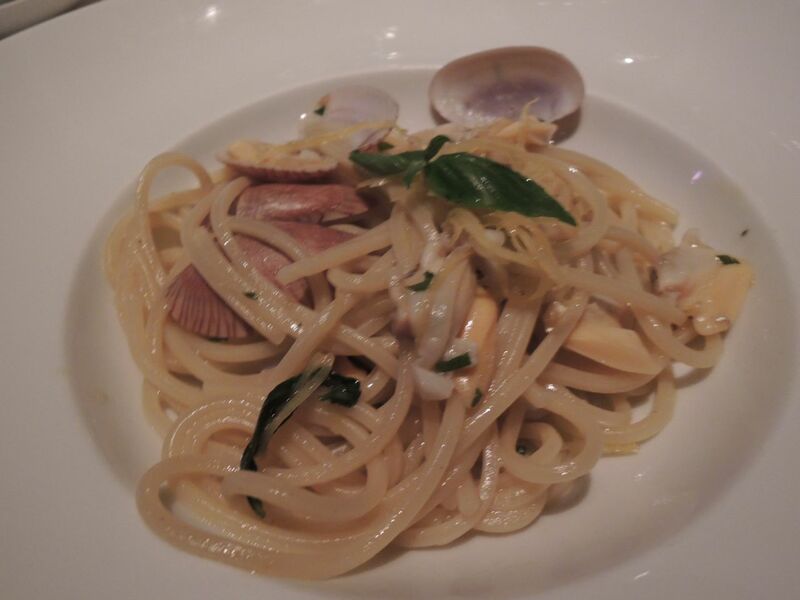 Nevertheless, the dinner was redeemed by the chitarra spaghetti with clams, a simple looking dish but in fact was complex in flavours. First the clams were delicious and sweet, then the pasta had a zesty taste thanks to the addition of lemon. For the mains, there was a roasted lamb rack with red wine reduction that was hearty. It seemed like too much to finish, but it tasted so good, that I found myself finishing most of the second piece. It came with eggplant parmigiana, an interesting accompaniment as it’s usually a dish on its own. Another main course was the pan-fried cod fillet with San Marzano tomatoes that was a lighter option. The traditional dessert of Naples Baba, a yeast cake saturated in rum syrup and cut in half and filled with vanilla cream, dressed with fruits. 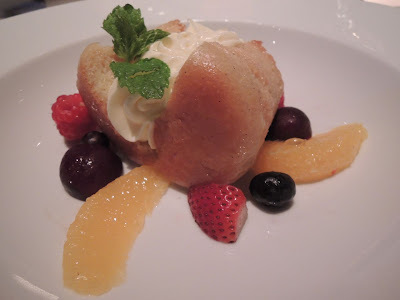 We loved the dessert, pity there wasn’t more rum in it!